John C. "Jack" Van De Walker age 79 of Mazeppa died on Saturday, April 23, 2011 at his home. A memorial service will be held on Wednesday, April 27, 2011 at 2:00 PM at St. John's Lutheran Church in Mazeppa with Reverend Alan Horn officiating. Inurnment will be in Mazeppa Cemetery with Military Honors provided by American Legion Post #588 and the Mazeppa Veterans Honor Guard. A memorial gathering will be held on Tuesday, April 26, 2011 from 5:00 - 7:00 PM at the Mahn Family Funeral Home - Larson Chapel in Zumbrota and on Wednesday one hour prior to the service at the church. John Clyde Van De Walker was born on December 20, 1931 in Milton Township, Dodge County, MN to John E. and Grace L. (nee Rehling) Van De Walker. He grew up in rural Pine Island and attended school in Pine Island. In his teens, John participated in Golden Gloves boxing. In 1950 he graduated from Pine Island High School. On November 15, 1950 he entered the U. S. Navy. He married Eva Gayle Sommerfield on June 1, 1951 in Cresco, IA. Jack served during the Korean Conflict and was honorably discharged on September 15, 1954. After his discharge they lived in several communities while Jack started his career as a mason with Don Clemens Construction. In 1959 they moved to Mazeppa and Jack started working for Alvin Benike Construction. After thirty two years with Benike Construction, Jack went to work for J & K Construction in Faribault and he retired in 1997. 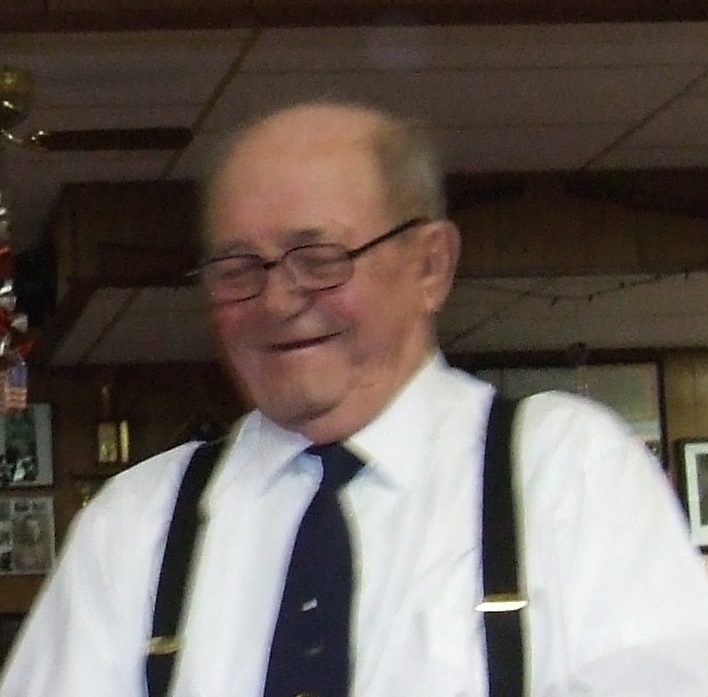 Jack was a member of Union Local #8 in Rochester and a life member of the Int'l Union of Bricklayers and Allied Craftworkers. John was also a life member of the American Legion Post #588 in Mazeppa, where he was past commander and held various other offices, a charter and current member of the Mazeppa Lions Club, where he also was past president and held various other offices, the Mazeppa Veterans Honor Guard, Mazeppa Senior Citizens and St. John's Lutheran Church. John also served his community by serving twenty years with the Mazeppa Volunteer Fire Department, serving on the city council and was mayor in 1967. Jack was known for his generosity in giving of his time for service projects and for supporting various causes with monetary donations. He enjoyed hunting, fishing, gardening, playing cards, reading western novels and working crossword puzzles. John is survived by his wife, Eva; children, J. Larry (Sherree) Van De Walker of Wanamingo, Kathy Van De Walker of Mazeppa, Jerry (Jackie) Van De Walker of Mazeppa, Kevin (Lisa) Van De Walker of Wanamingo, Sandra Van De Walker of Mazeppa and Kurt Van De Walker of Lake City; thirteen grandchildren, seven great-grandchildren, sister, Arlene (Bob) Noser of Zumbrota and brother, Jim (Barb) Van De Walker of Pine Island. He was preceded in death by his parents.